Oro Grande Lodge is the newest condo complex in Keystone Real Estate. Built in 2001, Oro Grande Lodge is centrally located to both River Run and the Mountain House in Keystone, CO. The building has 50 residences on 3 floors, comprised of 23 – 1 bedrooms, 23 – 2 bedrooms, and 4 – 3 bedroom condos. The Oro Grande Lodge building layout allows for many different views of either the Keystone Ski Resort, an aspen and pine filled mountain or down valley towards Dillon, Colorado. Located just across Highway 6 from the Keystone Ski Resort, it is a short walk to the base of the slopes. Oro Grande Lodge condos are finished with tiled granite or stone counters in the kitchen, stone entry and fireplace surround, tiled stone in the bathroom and larger decks. After a fun filled day on the slopes you can relax at the indoor pool or hot tub located at Oro Grande Lodge. The property also features a fitness room, guest and owner lockers, and a heated garage. 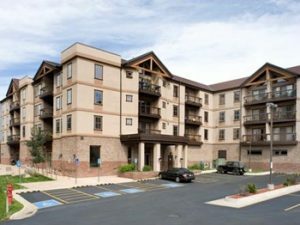 If you have been looking at Keystone CO Real Estate and considering purchasing a condo for sale in Keystone CO take a look at Oro Grande Lodge.